Some would argue that Speedway Stout, easily one of the finest coffee-infused imperial stouts in the world, needs no embellishment, that this burly yet beguilingly smooth and easy-drinking beer is perfect on its own. We’re not ones to disagree, but a thirst for experimentation leads us to tinker with our recipes—even those of the highest order. In the case of Hammerhead Speedway Stout, we endeavored to maximize java intensity as baristas do with the classic coffee-house offering, the “hammerhead,” in which a shot of espresso is added to a cup of coffee. For this beer, we take our already coffee-rich Speedway Stout and add a plentiful dose of crushed Ethiopian and espresso beans. The result is a sultry, velveteen beer with eye-opening bite. Bought this way back in March of 2016 for a trading partner in Colorado. We weren’t going to be able to meet up, however, and I got to have it all to myself. Gave it a 4.50 and called it “marvelous” back in March of 2016 with a 4-oz. taster. Hopefully this review follows that lead. O- another solid Speedway variant, only downside is that it seems a bit more dimensional compared to some of the other variants. had this on tap. great looking stout. notes of milk and dark chocolate, smooth vanilla, creamy marshmallow like thing, immense roast, coffee notes, dark malt, subtly bitter espresso. sharp roasty booze on the finish but it comes through smooth and round due to the sludge like texture. Had this in a 8oz tulip on draft at Pub Royale in Chicago. This bad boy packs a serious punch of bite for a stout with definite popping coffee flavors and a great creamy splash to the palate. It is big, delicious and has you craving for more. I would love to find this in bottle form! This is basically an extra coffee speedway. The espresso adds an heightened bitterness that you don't get from beers that are brewed with cold brewed coffee. 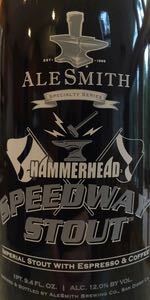 It certainly is good addition to the regular speedway stout. I enjoyed it. A - Poured into a Kate the Great tulip a nice dark black hue with a fat mocha head that fades to leave nice lacing and super thick blanket and legs. S - Big aromas of fudgy chocolate and super intense coffee notes. Nutty, earthy coffee, very nice roast. Not really acrid or bitter. Super aromatic. T - Taste is similar to the nose with big bright fudgy notes. Huge dark chocolate and bakers chocolate. Almost coconut like. The coffee is excellent, nutty, earthy, rich. Light caramel, little bit of vanilla on the finish. M - Mouthfeel is lightly carbonated, creamy, silky, alcohol hidden shockingly well. O - Overall this was a very solid coffee stout. Just excellent beer with stupendous coffee notes.